The boopiest clicker game going. Don't think there is anything I could add that hasn't been said before. congrats on the progress in just 10 days! Originally the idea for the game was to move the bottom platform from left to right bouncing the bear around into the pots, but considering my options I decided against that and shifted the mobility to the bear which made it's rag doll a little bit of a problem as you probably noticed trying to move around, as in it would straight up refuse to go in a direction sometimes so for that i'm sorry. Thanks for letting me know though and don't worry I got plenty of time to keep adding to it. yeah I can see that. I should mention then that holding down any of the jump buttons will make you go higher but, if you still can't get to the second floor try jumping again in the air for a little boost. Sugawara Chronicle - Demo community · Created a new topic I liked the game! Graphics were kinda meh to me especially in the text but thanks for that anyways. Also It was a meticulous process but that is not the reason I chose the metronome method, I chose it because I realised I had about a day to hand craft 4 tracks each about 5 mins long which would far exceed the time given for the jam and though I still have the start of each sequence I will never complete them. As for feedback the thought did cross my mind but I have never joined such a short jam before and wasn't able to make it. First off thanks for so much to go off of and I didn't think it was mean like you were worried. So let me fill in the reasoning behind the things I had done for that game. Point no.1 was a thing about the difference in detail in the graphics, I had some stuff in my mind that I wanted to create for example the tree on the edge of a cliff like grassy field, the reason there is difference in quality is because if the character was the same as the background I was afraid of it blending in or just not looking like a person. Point no.2+3 the shapes are actually perfect, for some reason when I imported them edge on the sides was cut off and I didn't have time to fix it with how much I had left to do as well as taking into account my computers speed in exporting the games. Q was not in the pixlated font because there was no Q in the pixlated font, it looked like an O which might have confused the player. I admit I should have found a better font so that's my bad. point no.4 I honestly did plan on making custom sequences for each song but due to the length of the songs there was no way I would have gotten it done and so I spent most of my time making a spawning system with custom speed and timing in order to try and at least get the tempo of each song correct so the player did not seem completely disconnected from the song. also to be honest you could literally button mash any rhythm game and get a decent score, Iv done that many a times on OSU! point no.6 I have no idea whats going on with those UI buttons I have a very limited knowledge of coding so I doubt that will ever get fixed. I'm sure these things are annoying for anyone but ya gotta know this is my first ever 48 hour jam and so I was bound to make mistakes. I also personally want to say congrats on actually completing a track they were ridiculously long, for some reason a short piano composition is alien to royalty free web sites. Music Game Jam community · Created a new topic Can we look for royalty free music before the jam starts? Looking for a music library could take some time. its technically not starting the jam before the start its just seeing what I like so I can bookmark it for later. seeing the shortness of the jam that would let me start earlier then spending an hour or two just searching. it's slightly harder now there are more than just the arrows. Short and Sweet Jam community · Created a new topic Are parody games allowed as long as its cute? I understand that it might have seemed confusing to anyone who was playing but I hadn't the time to create a tutorial squence, some buttons do work currently but again due to time I asn't able to make any funtionality for the military tab, its only there currently to kinda say this is going to be a thing later. A quick 3d arcade game made with Unity3D were you try to destroy as many objects as possible before time runs out. This game was made for #1GAM as my 5th game for this challenge. All assets for this game are self made. Ballista Bunny is a free 3D cartoon style action arcade game. In this game you play as a bunny on Easter who has to defend itself against everlasting hordes of chocolate craving kids who believe you are the Easter Bunny. The game is currently only for windows but will have a Mac release later on. This game is also in-development and will be updated on a regular basis depending on my availability. For those who do not have an Itch account this game is also on GameJolt but can not be advertised here. Strawberry Jam community · Posted in multiple version of the game ?? Yes you can upload your game and then update it as you wish during the game jam, the rules do not say you can not. itch.io Community » Game Development » Release Announcements · Created a new topic Game Release 'Boop a Beast' For the "My First Game Jam Winter 2017"
HAY! do you like cruelly harassing animals by booping them violently to gain money, well then my new game 'Boop a Beast' would be ideal. Boop a Beast is a free 3D clicker which is theoretically endless that is still in-development. Thanks for the tip I didn't know before. It should be fine to play now if you are still interested. Boop a Beast Is still in development but because I know i'm lazy and I'd miss the timer I uploaded it. the concept seem fun especially if you could make puzzles like fireboy and watergirl. I have an idea for you though, seeing that your characters are a dog and a cat why don't you have a timer like in n and when I runs out the game ends on a screen of the dog trying to eat the cat. Changed Resolution to 1280x720 so that it doeskin seem like the screen is cluttered with UI stuff.Added a basic score board and main menu and respected stand in fonts as well as fixing mechanics and bugs. Game now kinda savable aka it remembers where you left off when you last played. I'm having a hard time thinking of things to add to the updates so the next time I update this page is when its basically complete just to tell you what I did and that it would be coming out soon after the update. All added screen shots as always are attached to the screenshots link Above. 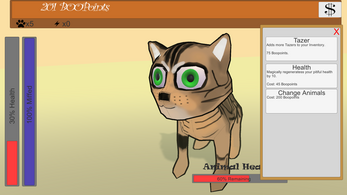 Description: Boop a beast is a fun 3D modelled clicker where you farm boops from "willing" animals. The game is playable but is not ready to be classed as done yet as you can see from the to-do lisy at the bottom of the page. The game currently is a traditional clicker however I would like to put my own twist onto the actual game meaning If I want to add my own twist I may not have it done by the end of the jam (lets hope people still play it after I update it if I cant do everything). Over the past 4-5 days Iv been Modelling/Sculpting, Rigging, animating and scripting and have some screenshots ready to show but almost everything is only temporary and not final so take a look with less judging eyes if you can. p.s. I don't really know how to insert screenshots so the link will have to do sorry. Added a shop as well as one of two weapons used to calm the beast, Also Textures and animations have been created as well as they are every going to get. Bug fixes have also been going on over the entire day almost. because of these improvements to the game there is no doubt that it will be finished by maybe even as close as Sunday, however I would still like to add more than just one animal and that may push the date a little further, even so the date will be closer than I thought it may be. The screenshots of this update have been added to the list in the link. below. I like the sound of this game already justfrom the premise, it sounds like it would be really funny and cutsy :) not to mention it has some good looking art to back it up. I'll be sure to play this one if you get around to submitting it. Haya all I obviously go by KingZer0 on some parts of the internet as you can tell by my profile name. I started making games as a pas time, I already knew how to 3D model, texture, composite, animate ect so I though it might be fun to expand to games and make thing that I would enjoy playing as an excuse not to upload them. However I'm going to bite the bullet and try out a game jam to publish a game and see what you might think.. I guarantee it may not be visually appealing but I do hope it at least makes you smile eaither from how bad it is or by how fun you might think it is (tbh it could go eaither way). As for the actual game the base materials are all almost complete and seem to fit together well but it still has a long way to go. Welp that's all I had to say, look forward to what everyone else thinks of what I am going to make. And enjoy the jam!